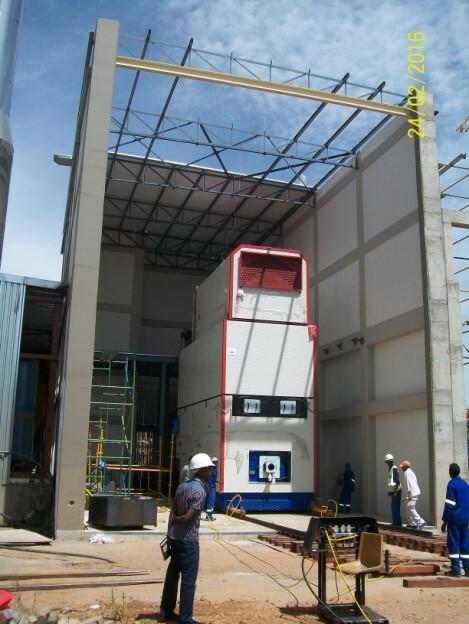 LCE was commissioned to design, prepare tender documentation and perform construction supervision for the building complex housing the new 5 MW biomass boiler at the NBL factory in Windhoek. The complex consists of two buildings with unique structural requirements. The boiler building is a 13.6 m tall framed structure with a 2.5 m deep basement. It houses the 10 m tall, 160 t, 5 MW biomass boiler and all mechanical and control equipment relating to it. At 6 m height, a steel floor was installed with a load capacity of 1.5 t/m2. Adjacent to the boiler building is the biomass silo and bulk fuel store building. This is an 11 m tall concrete walled structure which houses a ‘moving floor’ hopper system. This concrete structure accommodates horizontal forces created by two 100 t hydraulic jacks. The bulk fuel store area is designed to allow loading and off loading of wood chips with a tipper truck and tele-loader.